Saxophonist Nisar Ahmad "George" Khan (not to be confused with Los Angeles jazz pianist George Khan) was born in London in 1938, to a mother of English, Italian and Swiss heritage and a Punjabi father. Since his 1966 recording debut in the quintet of pianist (and onetime SME member) Peter Lemer � a band that also included John Surman on sax, and future Coliseum members drummer Jon Hiseman and bassist Tony Reeves � Khan has appeared on recordings with an impressively eclectic selection of bands, including other well-known names. These have included The Battered Ornaments, the band set up by Cream lyricist Pete Brown which he was subsequently ejected from just before the remaining members, including Khan and guitarist Chris Spedding, played at the 1969 Stones in the Park concert to an audience of hundreds of thousands. Khan was also in several Mike Westbrook bands including his jazz-rock octet Solid Gold Cadillac, alongside trumpeter and vocalist Phil Minton, and later had a period as a member of psychedelic rock band The Crazy World of Arthur Brown! Given such experience, it is remarkable that the double-disc album Ah! is the very first to appear under Khan's own name. 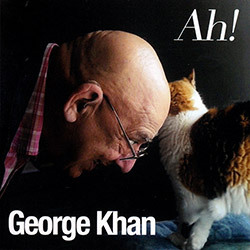 Despite Khan's flirtations with other styles, the music here is all free jazz or improv, recorded in a variety of London locations, spanning the years from 1968 to 2005. Although that could have given Ah! the disjointed feel of a compilation, all of its music is previously unissued and hangs together well, creating a picture of Khan with depth and rich detail. Crucially, drummer Terry Day features on all the tracks except two solo Khan pieces recorded live in 2005. Day himself instigated the release of this album, the bond between him and Khan dating back to the early sixties when he was a student at London's Royal College of Art, as was Khan's wife. Over time the two men became acquainted and played together, becoming founding members of the People Band (PB), which has two fine releases on Emanem. None of the tracks here is credited to the PB but two from May 1968, recorded in support of a student sit-in at Hornsey College of Arts & Crafts, feature Lemer on piano alongside Khan on tenor, Day on drums or alto sax, Frank Flowers on bass and Albert Kovitz on clarinet, the latter four all being in the PB at the time. And on two 1975 tracks, recorded at the Unity Theatre, Khan and Day are joined by former PB member Charlie Hart on bass and violin. All these tracks display the happy-go-lucky enthusiasm and collective energy that characterised the PB, with Khan frequently featuring prominently. Just as compelling is an extended Khan-Day duo, dating from 1980 at the London Musicians Collective. Its title, "Battling the Sound" hints at a dissatisfaction with the sound at the LMC space, but this should not be considered a deterrent to hearing it; throughout its thirty-three minutes both players are clearly audible in sufficient detail to keep the most critical listener engaged and, most importantly, the piece captures the empathy of the pair and the vibrant energy that they generated as they fed off each other. Finally, the album closes with those two Khan solo pieces, one on flute, the other on baritone saxophone. Neatly complementing one another, together the two are eloquent testimony to Khan's musicality and his ability to spontaneously spin out emotive melodic passages. A fitting conclusion to a very fine album.